Media Monarchy: did hubbard plagiarize scientology? from iheartchaos: The answer appears to be: Yes. 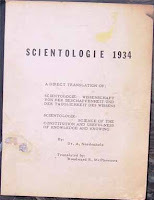 In 1934, a Dr. A. Nordenholz wrote a book entitled Scientologie that L. Ron Hubbard read a total of one time and decided later in his great moment of marketing genius to base a religion on these strange psychological ramblings of this Doktor. Scans are below, courtesy of Enturbulation.org or you can read the whole thing online here.